Since the last ten years, the medical technologies have significantly improved, thus encouraging the work in this research field. In order to make surgical operations more efficient, time-saving and cost-effective, new minimally invasive techniques have been developed. These techniques constrain the movement and the field of vision of the surgeon. A lot of research is consequently carried out to guide and support the surgeon during the operation. My diploma thesis concentrated on a particular organ: the liver. This work (supervised by Stefan Suwelack at KIT) intended to carry out a numerical study about a finite-element model simulating the mechanical behavior of the human liver. Such a finite-element model enables a non-rigid registration in real-time between the preoperative and intra-operative data thanks to the a-priori knowledge of the mechanical behavior. 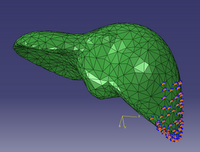 However, it assumes that the computations required for the liver modeling are achieved in real-time. As a result, our finite-element model had to be extremely efficient in order to continuously guide the surgeon during the operation. 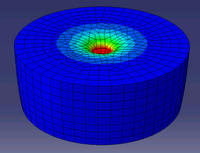 Indentation test on cylinder geometry with liver properties. First of all, the continuum mechanics theory related to soft tissues was studied and a literature review was carried out. The notion of large deformations and the different constitutive laws capable of modeling the liver behavior were introduced. Secondly, the implementation of a numerical work flow was explained in detail. A first program simplified the finite-element calculation and a second one computed a geometrical error between two meshes. Next, the mechanical constitutive laws presented previously in the theoretical part were studied. Three viscous hyperelastic materials with different parameters were compared. From this comparison step, one of the three materials was selected as reference material modeling the liver behavior at best. In the last chapter, this reference material is approximated with a hyper elastic material using a Rayleigh damping. This simplification of the reference model aimed at improving computational performances. Finally, we analyzed the influence of the material constitutive law on the accuracy of the geometrical results depending on the boundary condition used for the deformation. Liver finite-element model with fixed boundary conditions. This project was conducted within the team from Dr. R. Dillmann from the KIT and was my first experience in the field of medical simulation.